This Geminid meteor was imaged by Alan Dyer from Gleichen, Alberta, Canada on Dec. 12, 2004. © 2004 Alan Dyer, used with permission. If you missed out on last month's Leonid Meteor Shower,don't fret. What potentially will be the best meteor display of the year isjust around the corner, scheduled to reach its peak during the overnight hoursof Dec. 13-14. The Geminid Meteor Shower, in fact, is already underway. If the Geminids occurred during a warmer month, they wouldbe as familiar to most people as the famous August Perseids, which people oftennotice by chance when they're out camping or otherwise enjoying a warm summernight. 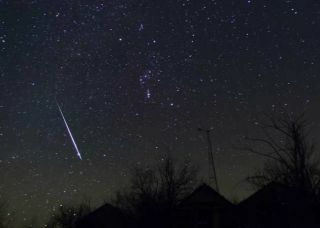 The Geminids, on the other hand, come at a time when much of theNorthern Hemisphere is experiencing bone-chilling cold. But if you are willing to bundle up, this coming Sundaynight into early Monday morning will be when the Geminids are predicted to beat their peak. Depending on dark your location is, and how much of the sky youcan see, meteorsmay streak into view that night at an average rate of one or two per minute. The Geminids are ? for those willing to brave the chill of aDecember night ? a very fine winter shower, and usually the most satisfying ofall the annual showers, even surpassing the Perseids. Studies of past displays show that this shower has areputation for being rich both in slow, bright, gracefulmeteors and fireballs as well as faint meteors, with relatively fewerobjects of medium brightness. Many appear yellowish in hue. Some even appear toform jagged or divided paths.?? These meteors appear to emanate from near the bright starCastor, in the constellation of Gemini, the Twins, hence the name"Geminid." The track of each one does not necessarily begin nearCastor or even in the constellation Gemini, but it always turns out that thepath of a Geminid extended backward passes through a tiny region of sky about0.2-degree in diameter (an effect of perspective). In apparent size, that'sless than half the width of the moon. As such, this is a rather sharply definedradiant as most meteor showers go; suggesting the stream is "young" ?perhaps only several thousand years old. This year's Geminids willnot be hindered at all by moonlight. On Monday morning, the moon ? a narrowsliver of a crescent, just two days before its new phase, will come up over theeast-southeast horizon soon after 5:30 a.m. for most locations and will posevery little, if any interference for meteor watchers. Best of all, Earth is predicted to be passing through thedensest part of the Geminid swarm at around 5:00 GMT on Dec. 14. That meansthat much of Europe and North America will be in excellent position to catchthe absolute peak of this display, which should persist for more than severalhours. But don't get hung up on that exact timing. In fact,regardless of where you live, the very best time to watch for the Geminids willcome at around 2 a.m. local time on Monday morning. At that hour, theconstellation Gemini will appear almost directly overhead. Late Sunday night on through daybreak Monday morning, asingle observer blessed with a dark and unobstructed view of the sky mightaverage as many as 60 to 120 meteors per hour ? one to two meteorsightings per minute. People in cities and suburbs will see far fewer. Generally speaking,depending on your location, the star Castor begins to come up above theeast-northeast horizon right around the time evening twilight is coming to anend. As Gemini is beginning to climb the eastern sky just after darkness falls,there is a fair chance of perhaps catching sight of some Earth-grazing meteorsearly on Sunday evening. Earthgrazers are long,bright "shooting stars" that streak overhead from a point near toeven just below the horizon. Such meteors are so distinctive because theyfollow very long paths nearly parallel to our atmosphere. As Gemini climbshigher into the sky, however, the meteors these very long paths will becomemuch shorter. The Geminids begin to appear noticeably more numerous in thehours after 10 p.m. local time, because the shower's radiant is already fairlyhigh in the eastern sky by then. As was already noted, the best views come ataround 2 a.m., when their radiant point will be passing very nearly overhead.The higher a shower's radiant, the more meteors it produces all over the sky. Because Geminid meteoroids are several times denser than thecometary dust flakes that supply most meteor showers, and because of theirrelatively slow speed with which they encounter Earth ? 22 miles per second (35km per second) ? Geminid meteors appear to linger a bit longer in view thanmost. As compared to an Orionid or Leonidmeteor that can whiz across your line of sight in less than a second, aGeminid meteor moves only about half as fast. Their movement reminds me of field mice scurrying from onepart of the sky to another. The Earth moves quickly through this meteor stream,producing a somewhat broad, lopsided activity profile. Hourly rates begin to slowlyincrease on Dec. 10, appearing roughly above one-quarter peak strength. So you might want to go out any night between now and Sundayfor a practice session. Don't expect a great display, but it's a goodopportunity to scout a location and see a few shooting stars. Again, the besttime would be 2 a.m. your time. After Sunday night, the shower's intensity should drop off sharply:rates on Monday night/Tuesday morning will have diminished to about 30 to 60per hour. Yet, there is good reason to keep watching for Geminids even aftertheir peak has passed, for those "late" Geminids tend to beespecially bright. And renegade late stragglers might be seen for a week ormore after the night of maximum activity. Make sure you're warm andcomfortable. Meteorwatching in December can be a long, cold business. You wait and you waitfor meteors to appear. If they don't appear right away, and if you're cold anduncomfortable, you're not going to be looking for meteors for very long! The late Henry Neely, who for many years served as a popularlecturer at New York's Hayden Planetarium, once had this to say about watchingfor the Geminids: "Take the advice of a man whose teeth have chattered onmany a winter's night ? wrap up much more warmly than you think isnecessary!" Hot cocoa, tea or coffee can takethe edge off the chill, as well as provide a slight stimulus. It's even better if you canobserve with a friend. That way, you can keep each other awake, as well ascover more sky. Give your eyes at least 15 minutes to dark-adapt beforegetting serious about scanning the sky. Telescopes and binoculars are of nouse. Bring a blanket or lounge chairs so you can lie back, stare up and scanthe sky for long stretches of time. As you enjoy the display, here's something to ponder:Geminids stand apart from the other meteor showers in that they seem to havebeen spawned not by a comet, but by 3200 Phaeton, an Earth-crossing asteroid.Then again, the Geminids may be comet debris after all, for some astronomersconsider Phaeton to really be the dead nucleus of a burned-out comet thatsomehow got trapped into an unusually tight orbit. Joe Rao serves as aninstructor and guest lecturer at New York's Hayden Planetarium. He writes aboutastronomy for The New York Times and other publications, and he is also anon-camera meteorologist for News 12 Westchester, New York.